The contributions of Claire Stine (kneeling) and his father spanned an ocean and several decades. A global web of supporters, volunteers and staffers carry out Heifer International's work today, but 70 years ago it was all up to a few boatloads of cowhands. This volunteer crew helped out from start to finish, raising the animals, transporting them from the heartland to the shore and tending them on overseas crossings. Claire Stine, a lifelong Heifer supporter who died last year, was the original Heifer cowboy. His father, O.W. Stine, was at the church meeting when Heifer founder Dan West first pitched his idea of "a cow, not a cup" to provide cows as an ongoing food source to people robbed of resources during the violence and instability of World War II. That idea, put into action 70 years ago, spawned the creation of the organization now known as Heifer International. Claire Stine was part of it from the beginning. As a 16-year-old growing up on a 50-acre farm in Goshen, Ind., he was charged with caring for the first batch of gift cattle after his father volunteered him for the job. Stine's mother named the first trio of calves Faith, Hope and Charity. Faith, a stubborn Guernsey that Stine fed and watered each morning before school, made a lifelong impression. "I remember my mother remarking that Faith had an ornery disposition and was not inclined to go where we wanted her to go," Stine said in a 2012 interview. Faith had the grit to become the first Heifer heifer, traveling by train and boat to spend the entirety of her milk- and calf-bearing years in Puerto Rico. Faith found a home with Milton Lind Lopez, his wife and their 12 children, to whom she gave nine calves. The first Heifer cowboys fought hunger by taking cows to war-torn countries to feed starving children. Heifer founder Dan West's idea to send animals launched more than 7,000 young men and women on what were often their first overseas adventures. Most of these cowhands and the animals in their charge rode on ships dispatched by the United Nations Relief and Rehabilitation Administration (UNRRA) as part of a massive, multinational campaign to repair war-torn countries. Stine earned the seagoing cowboy label after high school. "I recruited two of my friends, and we three volunteered to go on a cattle boat," he said. Stine's older sister, also a Heifer volunteer, made the arrangements. The trio of young men shipped out from Newport News, Va., on a boat loaded with cows and horses being donated as part of what was then known as The Heifer Project. The seagoing cowboys' job was to keep the horses watered, fed and as clean as possible. Memories of the crossing were a blur for Stine, who never quite found his sea legs. "My recollection of the boat is very limited, as too often I was either in my sack or leaning over the side feeding the fish," he said. Once docked in Bremerhaven, Germany, though, Stine and his friends explored the town, taking in the tragic scenery the war left behind. "So our couple of days there was viewing the destruction of the town and visiting with a German family with one of our fellow cowboys who had met this family on a previous trip." 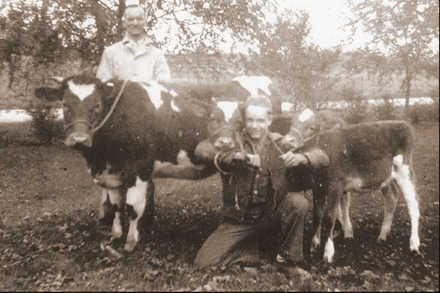 Stine's involvement with Heifer continued after his return to the states, as he maintained friendships with his fellow seagoing cowboys and correspondence with the German family he met in Bremerhaven. His relationship with Dan West also continued, and Stine looked to West as a mentor during a year of volunteer service with their church. "It was a most challenging time for me, and his comments and the sharing of his beliefs were very helpful in shaping my future," Stine recalled. Stine married, moved to Georgia and raised a family, but his connection to Heifer remained. His wife, Jane, was a beloved and dedicated volunteer, and the two accepted no gifts, only donations to Heifer, for their 50th wedding anniversary. They also traveled together on a Study Tour to visit Heifer projects in Poland. "I was very impressed," Stine said. "It's amazing to see what's happened (with Heifer)." Always humble, Stine refused to take any credit for raising those first Heifer animals and shepherding a boatload of cattle and horses overseas. "My involvement was so little," he said. Closer to home, they visited schoolchildren to talk about Heifer's work. During one visit to an elementary school, Stine offered each child a dollar and said they could do whatever they wanted with the money. They pooled it, bought ingredients to make cookies, and sold the cookies to raise money for Heifer. A cow brought over by the seagoing cowboys arrives at its new home. Heifer President and CEO Pierre Ferrari collaborated with Claire Stine in 2012 when the pair visited The Galloway School in Atlanta to talk with students about Heifer's work. "We were so grateful he came out that day to celebrate with us the passion that these children felt for helping poor and hungry families all over the world," Ferrari said. "I felt like I was sharing the experience with one of the pillars of our mission, and that I walked beside one of the great giants of our cause." When Stine died last year, Ferrari reached out to the Stine family to thank them for the role he played in creating the robust global organization Heifer International has become. "It was so clear that he understood something very profound about life, which is that much of the joy the world contains comes through service to others," Ferrari said. "Claire Stine and his fellow seagoing cowboys made the world a better place. We needed men like him then, and we need men and women like him today." Learn more about the adventures of the original seagoing cowboys as they share their journey to end hunger and poverty. Order Cowboy Memories from Shop@Heifer today.